THE CONTEST IS NOW OVER... THANKS TO EVERYONE THAT VOTED FOR US! 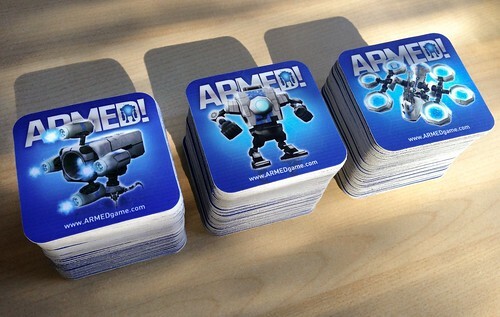 It has been quite busy here as the team has been hard at work on the upcoming ARMED! 1.9 release, our first iOS release, and OUYA support. Then we learned that Microsoft has selected us for the Next App Star challenge. Please go vote for us today and you will have a chance to win a Nokia Lumia 920. If you are on a Windows Phone right now you will have to wait until you have access to a PC as unfortinately it is a Facebook app. Once you vote hit the ARMED! Facebook page and drop us a message with your mailing address and we will send you these sweet ARMED! stickers for free! We're pleased to announce that ARMED! 1.8 is now hitting the Windows 8 Store and will be in the Windows Phone 7 Marketplace next week. Install the latest 1.7 release from the marketplace. Run the game at least once under wifi. Visit the Scoreloop screen in the game. Enter your email address (optional, but recommended). Install the 1.8 update over the existing 1.7 install... do not uninstall ARMED!. This is a one time migration issue we have to deal with. If you run into trouble contact us via support. Cross-Platfrom multiplayer enabled between Windows 8 and Windows Phone 7 clients. Two new levels added: Fortress and Waterhazard. New unit category: A.R.M-class vehicles added. Profile synchronization between Windows Phone 7 and Windows 8. Dozens of input and UI improvements to improve overall experience. Visual improvements to all levels. (Win8) Fixed bug that prevented some Intel users from starting the application. 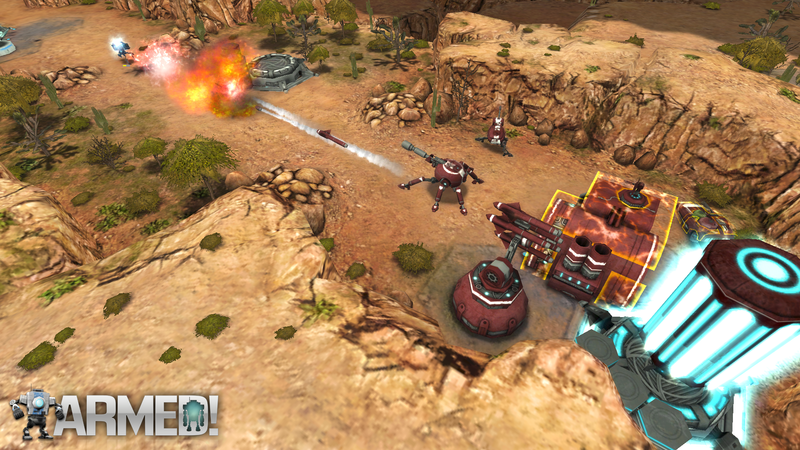 New unit- Plasmoid: A.R.M.-class Siege vehicle focused on long-ranged, area of affect damage. Unit Redesign- Mech: A.R.M-class Assault vehicle with powerful shielding, armor, and melee attacks. New A.R.M. Fabricator upgrade unlocks the production of A.R.M.-class units from factories. Players are only allowed one A.R.M.-class vehicle at a time..
New mechanic: Teleporters enabled on Waterhazard and Fortress. Striker cost increased from 125 to 150. The timer in a Live multiplayer game will pulsate and make sounds as it gets close to expiring. Changes to game logic introduce the possibility of multi-kills. Improved game-over sequence shown when surrendering a match. Added foliage cover to areas of "Riverted". Added a new animated skybox to "Flotilla". "Deserted" updated with detailed texture work and more saturation to the overall look. Lightened "Vilecano"'s coloring near the brim of the volcanos and added more trees in the soft cover areas. Improved "Sn0wned"'s textures to clearly define mountainous and unplayable areas. Units in a tile next to an non-aligned power station will always attempt to capture it. New alert notification voice overs. Many screens have been redesigned both for easier use and visual appeal. (Win8) Greatly improved the feel of both mouse and touch inputs. QE / Ctrl + (Arrow Left/Right) - Camera rotation. RF / PGDown/PGUp / Ctrl + (Arrow Up/Down) - Camera zoom. Camera control physics improved for pan and rotate. Profile pictures are now retrieved from Gravatar.com. Selecting an entry on the Leaderboard screen will take you to their profile. New background art for Splash, Build, Upgrade, Special, and Unit Info screens. New presentation of the results of ranked games. Live matchmaking searches now continue until cancelled. Selecting Build, Upgrade, or Special now pans the camera to show the closest selectable tiles or units if none are visible. Holding a path node over an area that contains a unit will switch between targeting the unit and the tile until released. 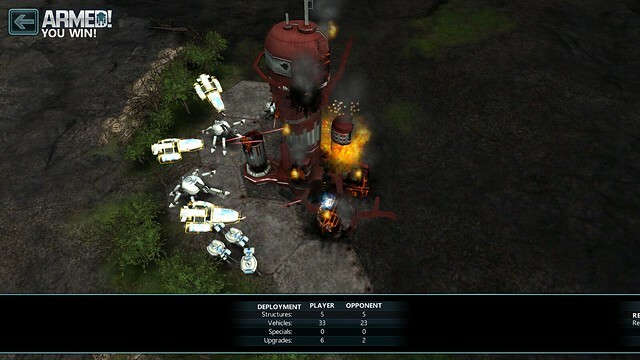 Resource control remains visible when the game is paused. New presentation of UI in the tutorial. UI Elements in the tutorial will blink as they're enabled. (Win8) - ARMED! Store opened to unlock new level content. Desynchronized games no longer count for rating. (Win8) Improved support for sharing content with other applications through the Share charm. Improved the quality of error reports sent for desynchronized games. Friendly units passing through the same tile will attempt to sidestep around each other. Reduced particle system's memory usage. The camera will continue to animate after the Game Over sequence. (Win8) Enabled BugSense for general error reporting. Big performance improvements for AI pathfinding. AI is better at patrolling the map. (Win8) Fixed major issue that prevented some users with Intel GMA video cards from starting the game. Fixed cases where the Incendiary Launcher's attack did not apply burn damage to units or tiles. (Win8) Fixed crash caused by quickly launching multiple message dialogs. Laser Turrets with the Cutter upgrade emit spark particles on each unit the beam damages. Rockets now correctly render their trailing flames. Fixed issue where resources would temporarily display the incorrect value when changing turns or exiting the game. Fixed bug causing attack beams to remain on the board. Fixed issues with double tap/click gameplay actions. Fixed cases where multiplayer games would get stuck in "Sending Turn..." step. Fixed memory leaks caused between multiple gameplay sessions. Fixed bug that prevented combat music from being controlled by Music Volume setting. Prevented situations where the game would crash when suspending. Fixed crash caused by units following each other. HQ no longer stops showing its shadow after being destroyed. ARMED! 1.7 has passed certification and is now starting to appear in the Windows Phone 7 Marketplace. This release was focused mainly on bug fixes... more specifically on fixing desync bugs in multiplayer. We're planning on shipping 1.7 for Windows 8 in the next week which will allow cross-platform play. We have also started work on 1.8 which will introduce new gameplay features and maps. The iOS beta is still in the works, but has taken a back seat due to some performance optimization and fixes. Added beta testers to the credits page. Made tutorial easier to finish. We now automatically pan the camera in the tutorial to better see important locations. Combat music now obeys music volume. While showing a modal tutorial information boxes, we now consume input to prevent unwanted user-action, also transitioning out hud controls. Adjusted the feel of edge scroll. Improved creation of paths off of small units like the drone. You can no longer accidentally remove a rally path when double tapping a factory. Balance improvement... cost of Striker increased from 125 to 150. We now slide out the gameplay HUD while a buy/upgrade/special screen is open. We now center pivot menus vertically as well as horizontally. Screen margins used for touch based zoom/rotate are now equal in size. Moved alert notifications to be on top of the hud. News feed now shows the "BUY ARMED!" link every third RSS entry. Combat alerts now smoothly pan the camera when tapped. Bunch of improvements to our internal stress testing system to help find desyncs. Animated skies now animate during deployment. Most UI and hud elements are now using uncompressed textures resulting in better quality. Improved event logging system for better tracking causes of desyncs. Tweaked all menu and UI art to be more blue and less aqua. We now move the camera position to show the current selectable tiles, selectable units, or unit selection if they are offscreen. Fixed spacing between rank and name in leaderboard screen. Fixed missing tree in Riverted. Fixed the layout of custom match screen. The time/money hud element no longer flickers when changing to the remote player. Fixed a case where the tutorial would get stuck if the user built more than 2 units before the step in which they are told to group them. Units standing next to power stations which are capturable will now ALWAYS capture it, previously only occurred if standing on a buildable tile (or pathed directly to the station). Hud flickering on group selection issue is now fixed. Removed the time/money control from the pause transition. Fix for bug that caused the grouping control transition to flicker when tapped. Fixing tap to select while in group/temp select mode again. Fixing double-tap to trigger buy again. Fixed strikers continuing to render their tracer beams after being destroyed. Desynch fix for path nodes targeting units, if that target is shared by multiple units. Fixed repair to not send damage notification events. Fixed case where player could modify the path of an enemy unit. Striker now displays the correct icon above it's head while doing it's special. Fixed layout bug in Sickhead splash screen. Fixed desync caused by not sharing paths on the remote client the same as we do on the local client. Fixed desync caused by allowing a path drag operation to modify a path after leaving the deployment phase. Fixed a few different tutorial crash bugs. Fixed case where if unit path was targeted to itself it would not advance to the next node. Fixed crash caused when following a targeted unit. Fixed bugs exposed by very bad network connections. 1.6 Release Notes And Price Drop! The Windows 8 release of 1.6 has delayed by a week or two, but will be out as soon as possible. The game over screen has been completely redesigned. Surrendering now has its own game finishing sequence. New presentation of matchmaking results. Gameplay HUD now includes back/pause button. Added logo/title/back badge across all game screens. Matchmaking live search now continues until a match is found or it is stopped. We tweaked the camera control physics for pan and rotate. Camera zoom now has some momentum and bounce. We now continue to animate the camera during game over sequence. Moved matchmaking screen AD to top right corner. The particle system now shares index buffers reducing memory usage. We now play a sound when a live match is found during matchmaking. We now disable the WP7 lock screen during matchmaking search. We hide the Back/Replay/Timescale buttons during the game over sequence. You now "surrender" a multiplayer game instead of "forfeit". We now show the published date on news items. Slider controls now react better to input. We now have a brighter disabled text color. Matchmaking screen now shows a 'Stop' button when searching. General optimizations to garbage generation for reduced memory usage and collection. The "Riverted" level has foliage cover in areas that were previously missing. The "Deserted" level was updated with detailed texture work and more saturation to the overall look. The "Vilecano" level has lighter coloring near the brim of the volcanos and more trees in the soft cover areas. The "Sn0wned" level has texture improvements to more clearly define mountainous and unplayable areas. Projectiles no longer emit particles at their origin. Made big performance improvements in AI pathfinding. Units will now prefer to path which is visually more direct towards their destination. Now all AI difficulties will decide to send units on patrol if there is nothing to attack. AI will now end its deployment early if it wants to build a factory, but fails do to not being able to afford it. AI now prefers patrolling around locations which are threatened. We added an acknowledge step for all turns sent to the server with periodic retries until we get confirmation. Vehicles now are rotated to face their rally path direction on creation. Units now visually pick a more logical rotation direction on construction. Flame thrower particles now have a starting random rotation. We now scale the pick box on units based on camera distance for better selection. The pick box for non-flying units is now extended downward to the terrain height. We now use the selectron instead of the pick box for the start of path dragging operations. Tweaked visual selectron size for all units. Units now logically move into a tile when they reach the halfway point of walk duration. Units following other units are now processed after the leader unit. Units following other units will now pause several moves before reacting when that unit moves. Units are now still processed during the move in which they are destroyed making simultaneously kills possible. Optimized out unseen polys on some units. Tweaked fog tile elevation across all maps. Unit shadows now animate their position. Fixed desyncs caused by unstable sorts. Removed floating point calculations which cause desyncs from unit target selection. Fixed desync by converting path neighbor ratings to use integer math. Fixed some incorrect event handlers causing stuck matches. Removed unwanted beep from the end of the gameplay music track. Fixed periodic crash caused by collection modification in a foreach. Fixed a bunch of memory leaks causing out of memory errors after dozens of play sessions. Fixed a bug which could cause music volume to be changed when leaving a game. Fixed issue where the game would get stuck in an infinite loop when the game ended. Fixed crash when updating leaderboard entries after leaderboard screen was exited. Fixed a replay determinism issue do to AI repathing units immediately after the reload. Fixed bug that allowed users to back out of buy screens on the tutorial. Fixed crash caused by too many open matches by adding a maximum to the list from the server. AI will now stop building ground units from factories at locations which do not have ground paths enemy controlled locations. AI will now repath units which it believes are stuck. AI will no longer get stuck if all factories fail to build. AI will no longer path units to locations which they can never reach. Fixed "Riverted" level build locations to solve stuck factory case. Fixed the small camera pan that would occur prior to a path node drag operation starting. Fixed interpolation jerk with evading drones. Fixed visual jaggies in the rocket projectile ribbon trail. Fixed a path node selection when there was greater than one node in the same tile. Fixing an issue with cluster not visually aiming upward when firing at distant targets. Fixed cluster attack which was not causing hit units to burn or igniting the destination tile. 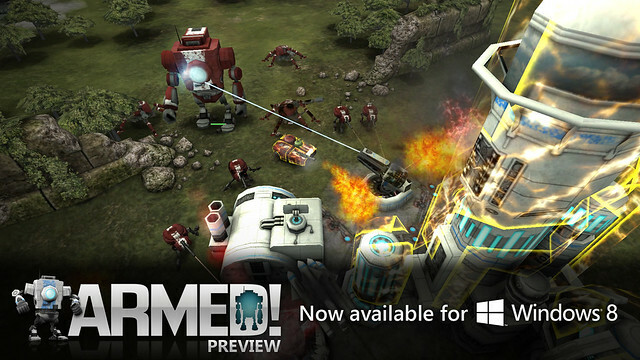 We're very happy to announce that the preview release of ARMED! for Windows 8 powered PCs, laptops, and tablets is now available from the Windows Store! This is a free preview build and will see several updates before Windows 8 is released to manufacturing later this year. Please give it a try and submit feedback to our support page. Note that while currently you cannot play between Windows 8 and Windows Phone users, the upcoming 1.5 release for WP7 will allow full cross-platform play for the first time. On a technical note the game code is largely the same between the Windows Phone 7, the new Windows 8 release, and the upcoming iOS release. This is achieved by using MonoGame, a cross platform implementation of Microsoft XNA which we have helped port to Windows 8 Metro. MonoGame is used by many games including Bastion for Linux, MacOS, and Chrome Native Client and Infinite Flight for iOS. Finally we're going to be live on the Metro Developer Show tomorrow Friday the 6th at 3pm CST talking about ARMED! for Windows Phone 7 and Windows 8 Metro. Come and listen to the live broadcast, chat with other listeners, and ask questions about ARMED!